Wanted to pop this up here. The real story is over at Newsarama, but I know you all rely on me for DP news and links, so click away. Doom Patrol #2 This Week! The Source has a nice little sneak peek inside the second issue of Doom Patrol. Unfortunately, the Source also says the book will be out on September 9th, which won't be true here in the States, due to the Labor Day holiday. Look for it at your favorite comics facility on September 10 instead. Rather than repost them all here, I'd like to point you there. I'd also like to share both covers with you right here. And the variant cover by Clark and Maguire. . . If you need some more inspiration to pick this book up, here's the solicit text. Let's just hope G'nort stays in the solicit. Oh, all right, just because you asked so nicely. . . here's a couple of panels from the preview. A little old, a little new. . . this ranting fellow above sure feels like a panel from Doom Patrol as it is meant to be. 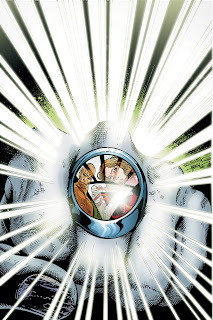 I've mentioned Blackest Night before, and I even went so far as to highlight the characters that appeared in issue 1 when Hal (Green Lantern) Jordan and Barry (the Flash) Allen were talking. In November, Doom Patrol #4 will be a Blackest Night crossover issue. Evidently #5 will tie-in as well. Read on for more details. When BLACKEST NIGHT falls, skeletons start coming out of the closets — and no one has more skeletons in his closet than Niles Caulder, founder of the Doom Patrol. Caulder has been playing god for years, and the time for a reckoning has come. The Doom Patrol thought they knew darkness. Find out how wrong they were in this BLACKEST NIGHT tie-in issue! So over on the DC message boards (why Giffen stomps around over there and not here is beyond me ;-P ) he mentions that there will be some Black Lanterns making an appearance herein. His post is from August 14 at 9:26 am. Only four? I can think of a few more than that. . . Of course in the image Hal projects, there are only three characters shown: Josh Clay, Val Vostok, and Arani Caulder. 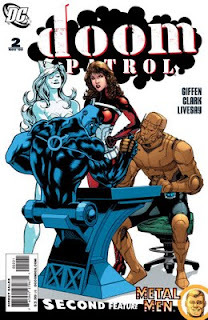 Those three would give us the "three" Giffen mentions, but who's the fourth? Did Giffen give us a clue above? Anyone else have any guesses? 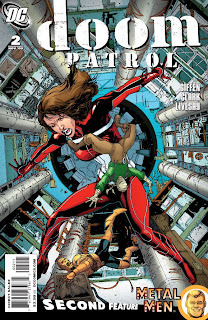 On a mildly related note, retailers will be getting bags of rings when they order copies of Doom Patrol. Evil yellow Sinestro Corps rings. Retailers order 25 copies of Doom Patrol #4 and they can order a bag of Sinestro rings. Bleeding Cool has so much more to the story. Continuing on with Blackest Night info, Elisabeth Gehrlein, editor of Doom Patrol gave us a few sneak peeks over at The Source, including this beautifully haunting and hauntingly beautiful cover by Justiniano for issue #5. Giffen's commentary about this cover is priceless. You should click the link above and check it out. Too lazy to scroll back up? Try this one. I love Matt Clark's work, but I'm glad they have Justiniano around to spell Matt every now and again so Matt can stay fresh. 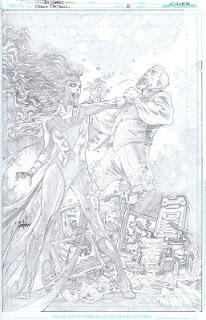 Next to Doug Mahnke and Ivan Reis, I think Justiniano is best suited to render the undead DC characters. In the timeshare that Gehrlein has employed for DP, it truly the best of both worlds.